radius | Syed Jahanzaib Personal Blog to Share Knowledge ! This script will EXCLUDE data in radacct and radacct_archive tables. 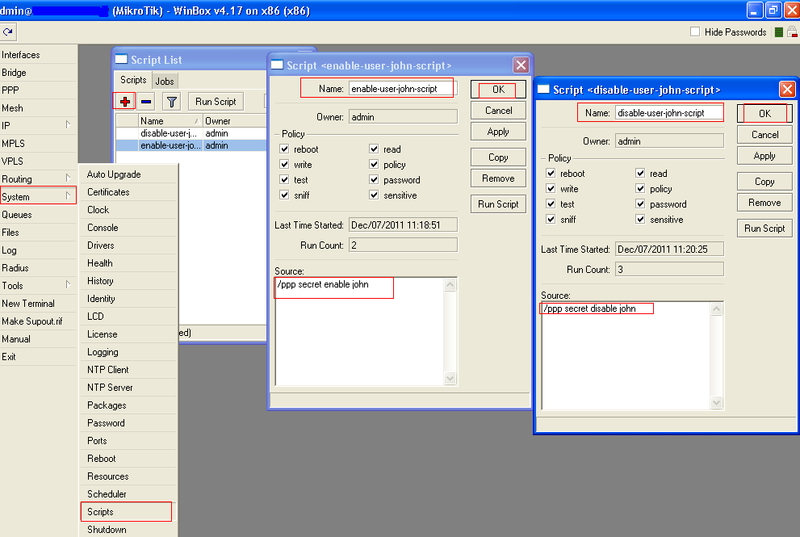 It will only export table structure without data. to reduce database size, you can modify this function. NOTE: Using S.S.D disk (or raid) are highly recommended as there are less chances of media failure, and above all read/write rates is incredibly fast. Plus If you have configured RAID , then it will provide redundancy as well. I am using KANNEL as sms gateway & sendEmail app to send email via GMAIL. First create temp folder and create script in it. 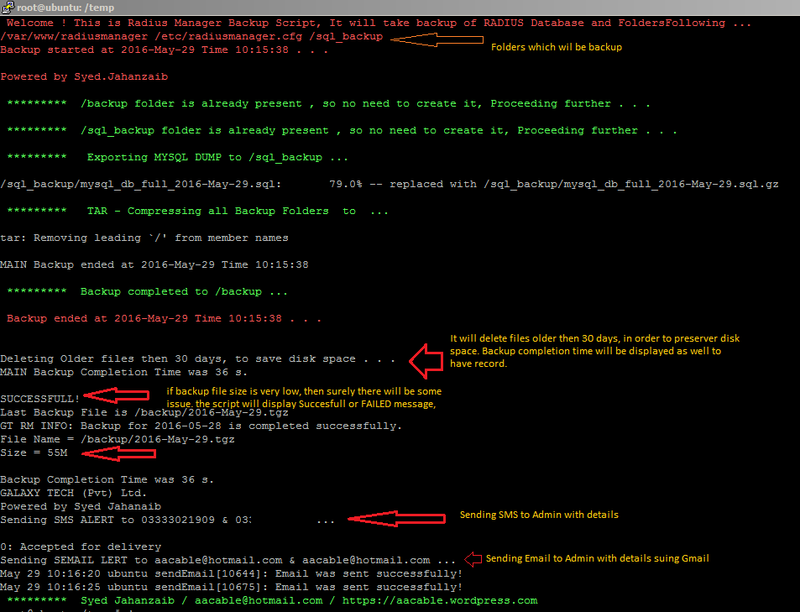 # This script creates FULL Backup of MySQL DB (Radius) and MYSQL DBR related DATA files. # Adjust below DATA fields accordingly. remove / add desired folders. CMD="mysql -u$SQLUSER --skip-column-names -s -e"
#$CMD "use $DB; insert into scripts_exec (script_name, lastupdate) VALUES(' fullbackup.sh','$TODAY $DT_HMS') on duplicate key update lastupdate='$TODAY $DT_HMS';"
echo "- $SAVEDIR_FULL folder not found, Creating it so all backup's should be placed there ... "
echo "- $SAVEDIR_FULL folder is already present , so no need to create it, Proceeding further ... "
echo "- /$SQL_DIR folder not found, Creating it so MSQL EXPORT/DUMP backup should be placed there ... "
echo "- /$SQL_DIR folder is already present , so no need to create it, Proceeding further ..."
echo "- $SRV service is accessible OK. Proceeding further ..."
echo "- ALERT: $HOSTNAME - $IPADD - DB $DB not accessible/exists - $DATE $DT"
echo "- $DB - database exist OK. Proceeding further ..."
$CMD "use $DB; create table if not exists radacct_archive LIKE radacct;"
$CMD "use $DB; INSERT INTO radacct_archive SELECT * FROM radacct WHERE acctstoptime is not null;"
$CMD "use $DB; DELETE FROM radacct WHERE acctstoptime is not null;"
$CMD "use $DB; DELETE FROM radacct_archive WHERE date(acctstarttime)  (CURDATE() - INTERVAL 1 DAY);"
echo "SQL file size is invalid"
echo "SQL file size is OK"
echo " - TAR Compressing all Backup Folders to $SAVDIR_FULL ... "
echo "- Deleting $SQL_FILE to avoid duplication"
echo "- Deleting $FINAL_TAR_FILE to avoid duplication"
- Backup ended at $6-$2-$3 Time $time . echo "- Deleting Older files than 20 Days from $SAVEDIR_FULL and $DROPBOX (if any) to save disk space ..."
echo "- DROPBOX $DROPBOX folder found, making backup file copy in $DROPBOX too ... "
echo "- Deleting Older files then 20 days from $DROPBOX, to save disk space ..."
echo "- Backup script completion Time was `expr $end_time - $start_time` s. "
echo "- Final tgz Backup file size is invalid"
echo "- Final tgz Backup file size is OK"
- Backup Time = `expr $end_time - $start_time` s.
Bkp Time = `expr $end_time - $start_time` s.
# Make sure you install sendEMAIL tool and test it properly before using email section. #SEND EMAIL Alert As well using sendEMAIL tool using GMAIL ADDRESS. 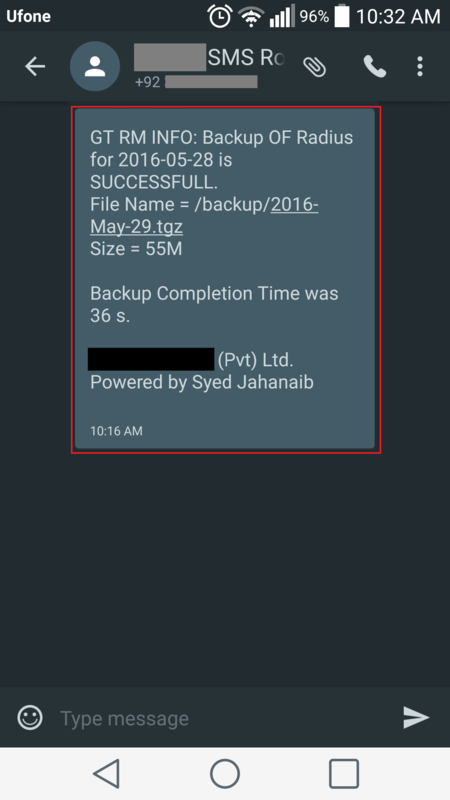 echo " - Sending SMS/EMAIL ALERT ..."
- Syed Jahanzaib / aacable@hotmail.com / https://aacable.wordpress.com "
Open terminal, (make sure you are logged in with the root user. 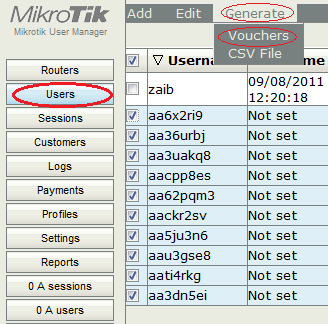 It would be great If MIKROTIK adds feature in USER MANAGER (UM) of adding serial numbers with each ID, So that we can print voucher with serial numbers, and can search ids by corresponding serial number. 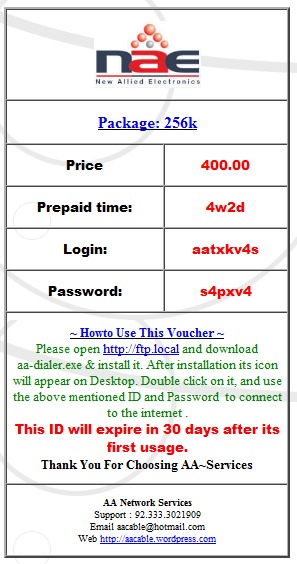 I have customized the following vouchers but unable to add serial number. then print it using my customized templates and add serial number to each id and store it in its database to prevent Duplication, and also add search function by serial. I will publish it soon. 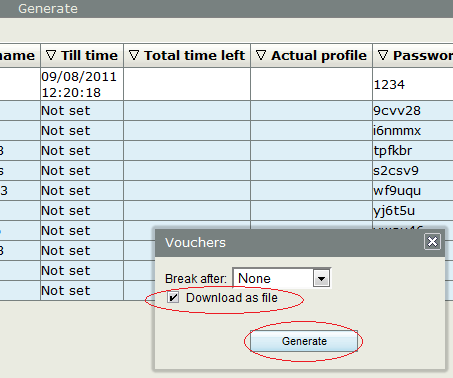 HOWTO Use this template to Print Vouchers for Single or Batch Users !! Now to use the template, goto Settings / Templates and in ROW section box, select all and delete , now paste the complete template in this box. and click on SAVE button. Now we will add Batch Users (Add Users in Bulk). Goto Users / Add / Batch Users. Select your desired options and click on ADD. Click on DOWNLOAD AS FILE and click Generate. It will then download the vouchers.html file and you can print it. 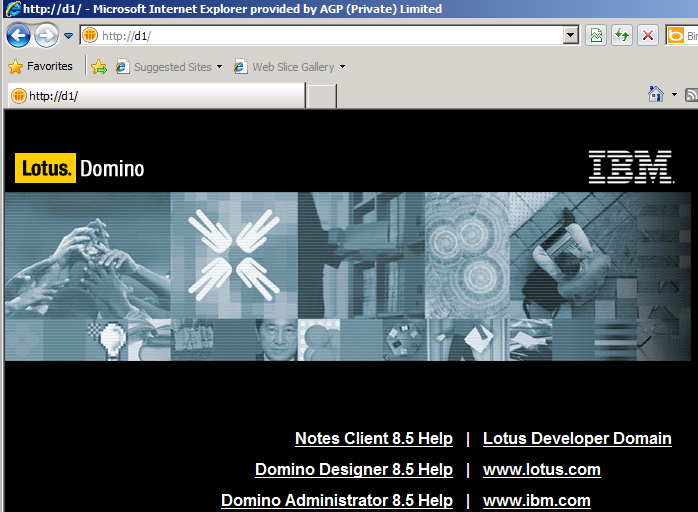 Note: I used 2 images, one is logo, second is background image, Both files are residing on the Local web server. You have to modify these links and files name to match according to your structure. 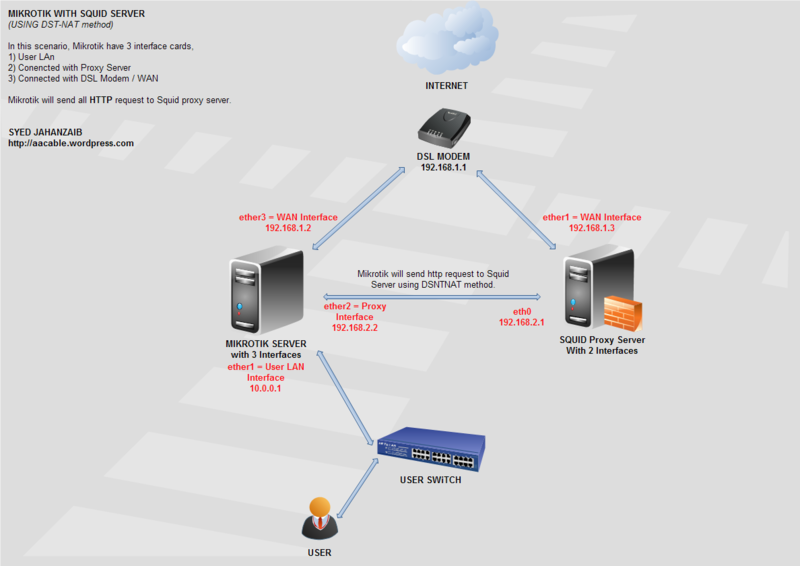 Mikrotik PPPoE Server with User Manager Pre Paid Billing System ! This guide will illustrate howto create PPPoE server in MIKROTIK RouterOS (I used v 5.6 in this example). This article will also demonstrate on how you can create your automated pre-paid billing solution for users using Mikrotik’s User Manager. This basic RADIUS Server a.k.a USERMAN can be used for any ppp service like VPN/PPPoE/HOTSPOT. 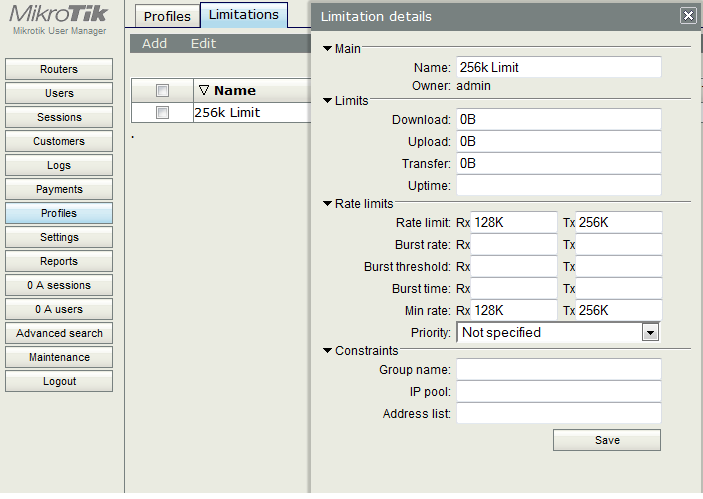 It will also show you how to create a 30 days limit account with 256Kbps speed limit. We will divide this article in two section. In this example Mikrotik have two lan cards. 2) ether2 = ip 192.168.0.1 / WAN interface connected with DSL / Fiber etc. Now we will add new profile for pppoe users. Following is the screenshot for above created rule. Add following rule to allow internet. Add DNS server so users can resolve internet hostnames. Now finally we will add local user to test the pppoe server status. 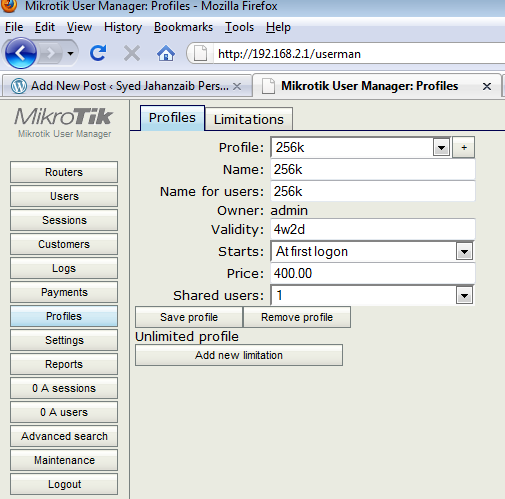 Now we will move to mikrotik billing system using its built-in radius called USER MANAGER. 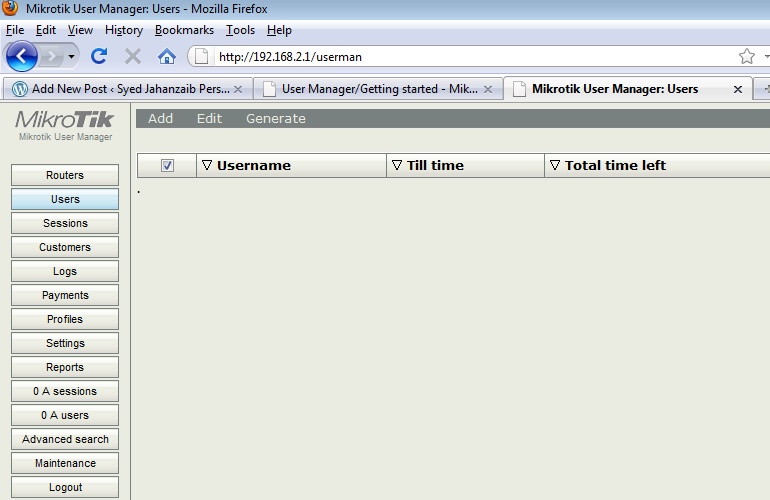 We can setup a RADIUS server in mikrotik using its built-in radius server called User Manager. UM is a nice web-based billing manager package to compliment hotspot / pppoe / vpn authentication solution in RouterOS. It is RADIUS based component so it can provide centralised management to single or multiple RouterOS based NASes. Now we will first configure user manager and then later we will integrate it with our pppoe server so all authentication will be done via UM. You will see user manager authentication screen, Now enter admin id and password and you will be forwarded to main UM screen like this. Now we want to add 256Kb / 30days Limit Package, Name it 256k. Done, your first package with 256k Limit and 30 Days uptime limit is created. Now we will Add new user and tag them with this new 256k profile. Goto Users, and click on ADD / One (to add single user). * in ‘Constraints’ check on ‘Called ID’ Bindon first use. This options is good if you want to bind user id with first detected MAC address, if you don’t want to bind , leave this option as it is. * in ‘Assign profile’ select ‘256k’ profile and click on ADD button to finish. Now that we have finished our basic work with UM, its time to integrate it with Mikrotik, so that all Mikrotik PPPoE authentication will be done via UM. We have to modify some settings, both on UM and Mikrotik as well. In UM we have to add Mikrotik Router. UM section is complete , now moving on to MIKROTIK to complete the RADIUS setup. Make sure you change the ip address as per your local configuration. 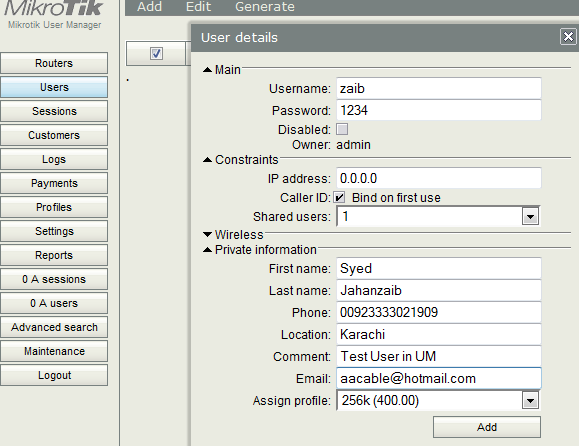 Now from client end, connect with Users id ‘zaib’ and password ‘1234’ that you created via UM. It should connect fine. After first connect, this ID will expires in 30 days and bandwidth limit will be 256kb download and 128kb upload. If you need any assistance, Do let me know. 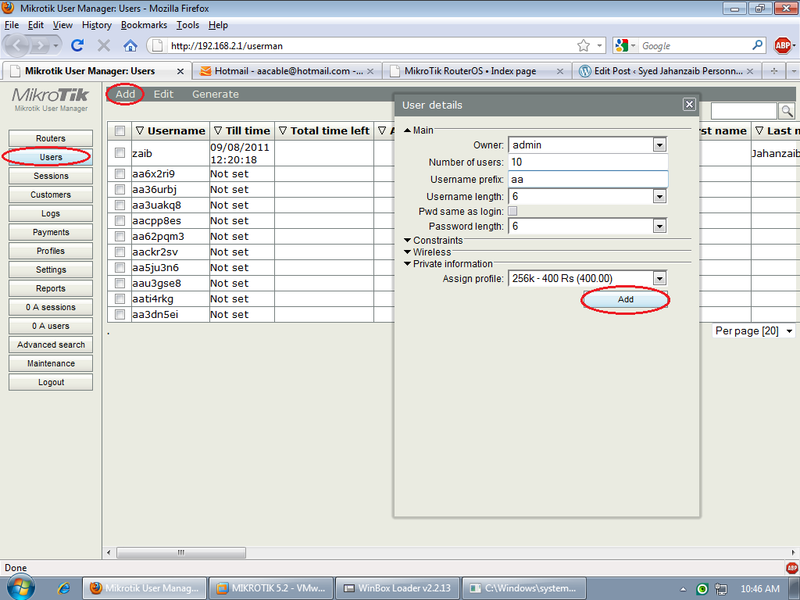 :log error "Clearing Data Base Logs ... It may take some time & CPU if Logs are huge in size......."
:log warning "Data Base Cleared ... Now Rebuilding Data Base , It may take some time & CPU if Logs are huge in size......."
:log warning "Data Base Rebuild Complete...."
Article by Syed Jahanzaib ! Recently I was contacted by a friend who was really passionate in starting a mini-ISP type network setup for about 3000 users in the interior area of city. (soon it may expand up to 5000+ users). He asked my help to setup a scratch card base fully automatic system where user purchase scratch card, & using User self care portal web site, user may create his new ID or refresh his previous ID or change the service package according to the card package offers. 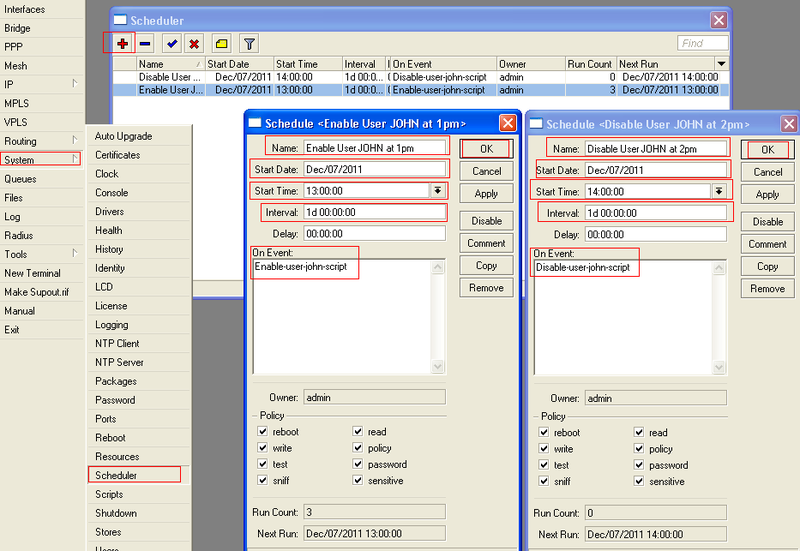 I had previously setup this kind of scenario in a cable.net environment using Mikrotik built-in radius server called ‘User Manager’, but it have very limited basic features and all it can offer was a pre-paid type option and it doesn’t have many accounting features. So I thought I should give a try to more rich feature radius server and after a lot of googling i decided to go with (FREERADIUS base ) DMASOFTLAB RADIUS MANAGER. A very famous radius server with all the option that a mini-ISP would required at unbelievably low price. The hardware that I have used for this setup. *Main Mikrotik = v4.17 x86 / Xeon 3.6Ghz Dual / 2 GB Ram / WD 500 GB Sata Hdd , This MT is serving as a PPPoE Server + NAT + bandwidth shaping. 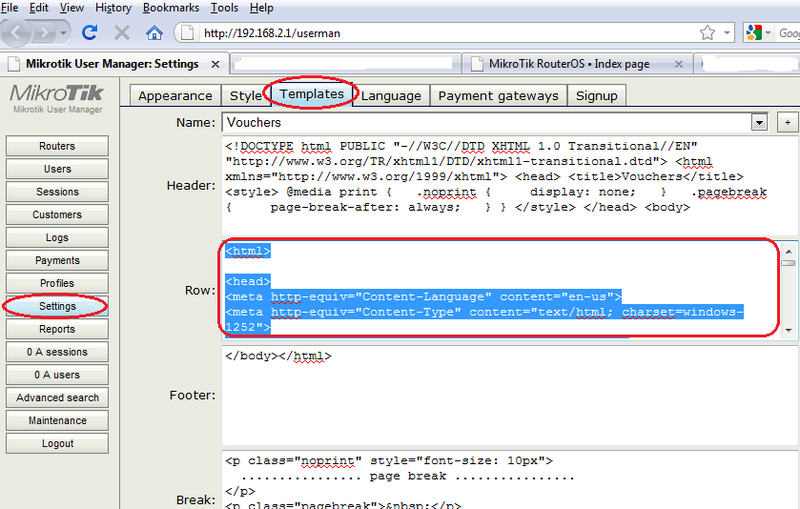 It also redirects HTTP traffic to Proxy server. * Mikrotik RB750 = Just for HOTSPOT to redirect users to self care portal. * SQUID PROXY GW = SQUID v2.7 on UBUNTU Karmic Koala v9.10 / Xeon 3.6Ghz Dual / 8 GB Ram / WD 500 GB x3 SATA HDD (2 HDD reserved for Cache), This server acts as a proxy + Gateway machine for the Mikrotik, It also do URL Filtering blocking ads, it also have ZPH enabled so content available in squid cache should be downloaded at full speed (without package limitation) at user end. It also cache youtube videos using VIDEOCACHE. * Linux Transparent BRIDGE firewall + DHCP + DNS + MRTG + WEB Server on FEDORA V10 / Xeon 3.6Ghz Dual / 4 GB Ram / WD 500 GB SATA HDD, This server sits between Mikrotik and Users , filtering unwanted traffic, ports and do some other stuff like lightweight DNSMASQ DNS Server, DHCP server providing ips to users , Web Site with MRTG , Psychostats ranking system for Counter Strike Game, Server Monitoring Scripts and Alerts, PHPBB Forums for Users, and some other cool stuff. DNS+DHCP is hosted on this server to minimize load on main mikrotik machine, alos this machine filters unwanted traffic from passing by to main mikrotik. In this setup , I have configured HOTSPOT on extra RB750 only to redirect user to my advertisement page, where he is informed that he is not logged in via dialer, either create / refresh his ID from RM User Self Care Portal, or if he already have an id, connect it via dialer. I don’t prefer HotSpot authentication due to various security reasons, mainly due to I had a very bad experience having HOTSPOT hit by ARP-POISONING and many virus flooder that requires default gateway. 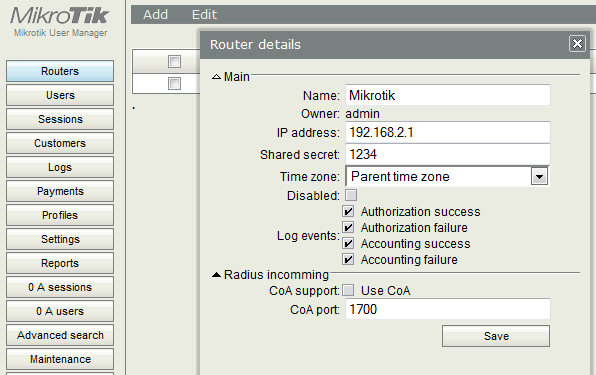 When users with pppoe dialer tries to connect to main Mikrotik, MT verifies its credentials by asking Radius Server for the account validity, if the ID is valid, user connects okay and can use internet , otherwise he gets disconnected. When the User account is expired, he still can login via dialer, but then he is redirect to my local web server page where he is informed that his account is expired and he should visit billing.local page to renew his account using the card. 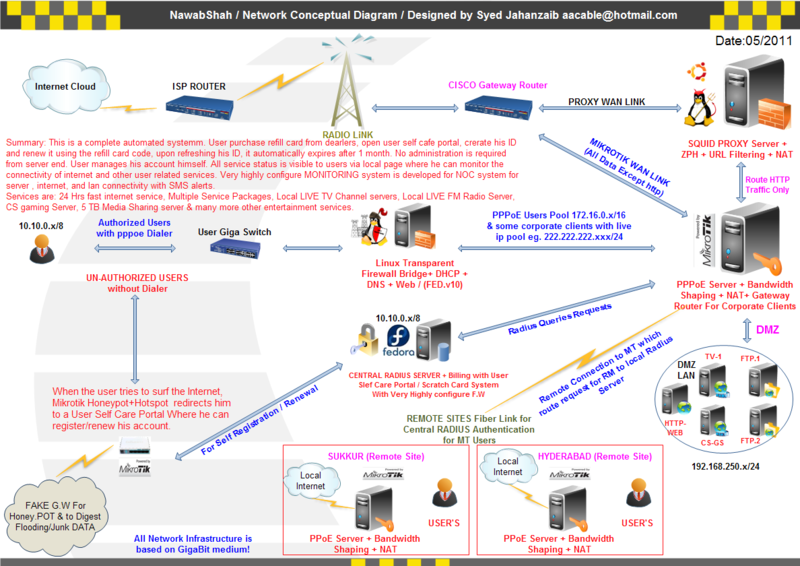 Please find along with attachment is my Network Diagram (This was initially designed, I made few changes afterward, I removed FTP from MT DMZ to user subnet lan to avoid load on MT , I moved ftp OS from windows to Linux and integrate it with radius authentication using APACHE. 1 Web Server (Ubunut) hosting site u-dear . com , an entertainment portal and hosting other features. It also features monitoring system with MRTG / SMS Alerts via attached Mobile. About RM: Radius Manager uses a nice web interface for administering the users and the whole system (traffic accounting, tracking of online users, display statistics, maintenance ,account management etc.). and to add that DMASoftlab customer support guys (specially Mr. Viktor.K) have excellent support and respond instantly even to the dumbest of questions. It is real value for money especially for those who do not have big wallet$.